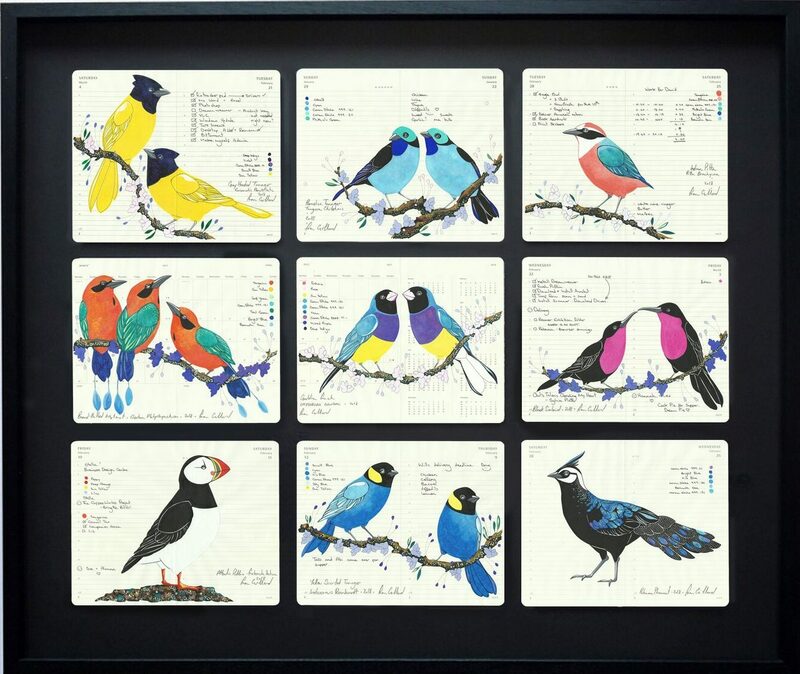 Artist couple Fran Giffard and David Wightman combine forces in this two person show that brings together brightly coloured mountain landscapes with beautiful birds on diary pages, so that you have a piece of the artist’s life within each work. Plus the gallery in Honor Oak Park is a new find for me, and it’s always great to come across a space I’ve never been to. Until 9 June. Throbbing music leads me into a green space with purple lighting. 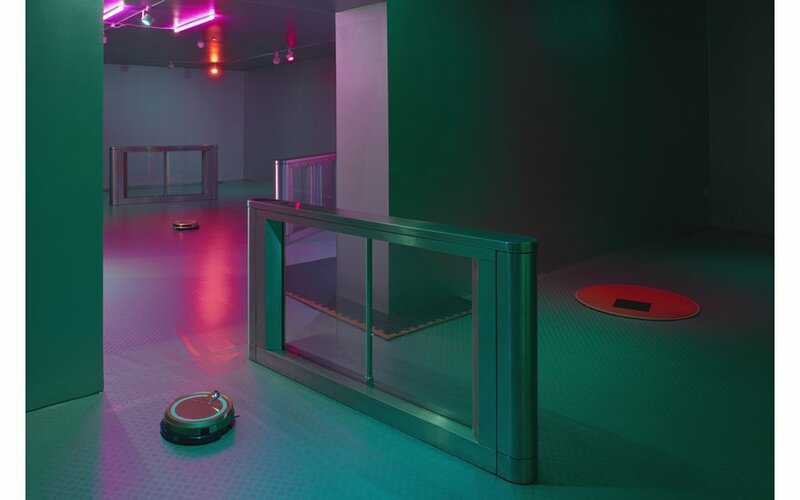 Roombas rove around a space that includes swipe card barriers. It’s as if the machines have their own party going on and no humans are required. It’s a playful look at the future and where our interaction with machines is heading. Until 10 June. Beautifully carved sculptures stand before me. They weren’t carved by human hands, but by nature. 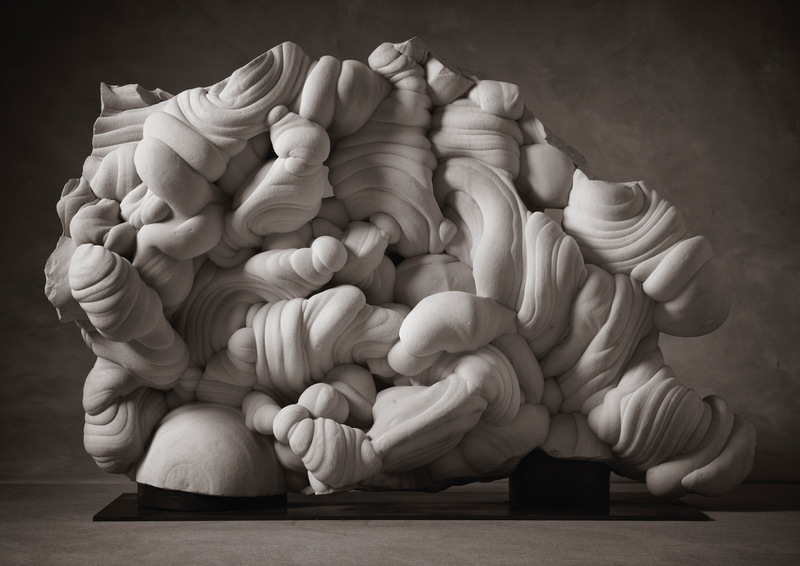 Gogottes are rare sandstone sculptures found in Northern France and their twisting forms are stunning. Until 1 June. Natural instinct is to head into the main exhibitions but head downstairs into the print sales gallery for a small exhibition of female artists looking at the photographic surface. 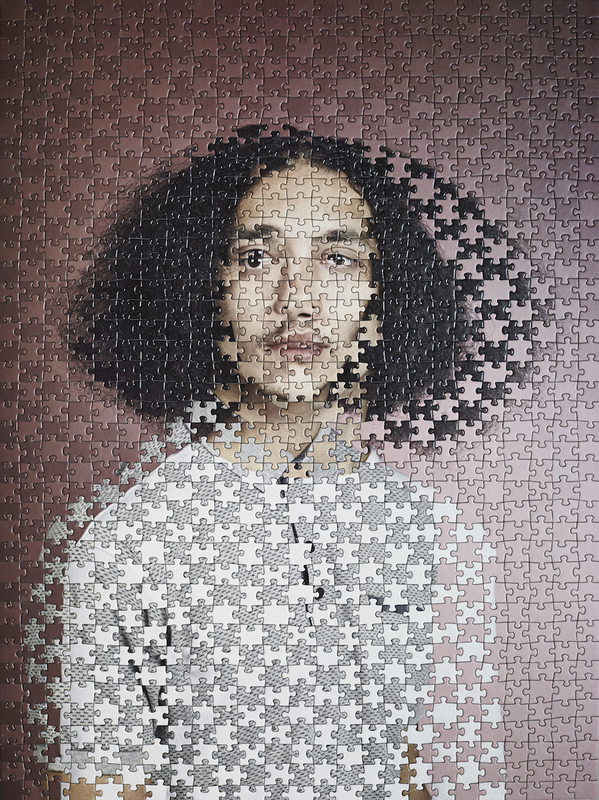 Favourites include Alma Haser’s work which re-arranges portraits using jigsaw pieces to create a new identity and the lovely lumpy textures of Felicity Hammond’s work. Until 9 June. Two commissioned mark the fifth year of this award. 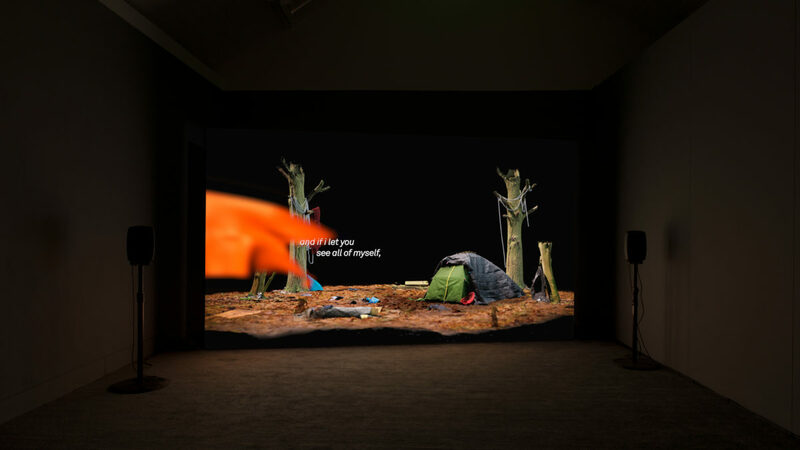 I was particularly impressed by Imran Peretta’s powerful work about migrants and how they are treated when they arrive in another country. 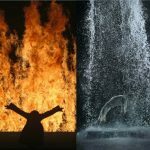 It’s a particularly relevant topic and the right balance between political impact and artistic expression. Until 3 June. Artist Molly Soda takes on the world of Youtube to expose it in all its hateful and supportive commenters in this exhibition. A basic make up tutorial draws out all the insults around aspects of her appearance that she needs to ‘fix’, but there’s also hope from those who try to shut down the trolls. It’s the comments section on Youtube so it’s not exactly a hotbed of nuanced debate with arguments breaking out all over the place. 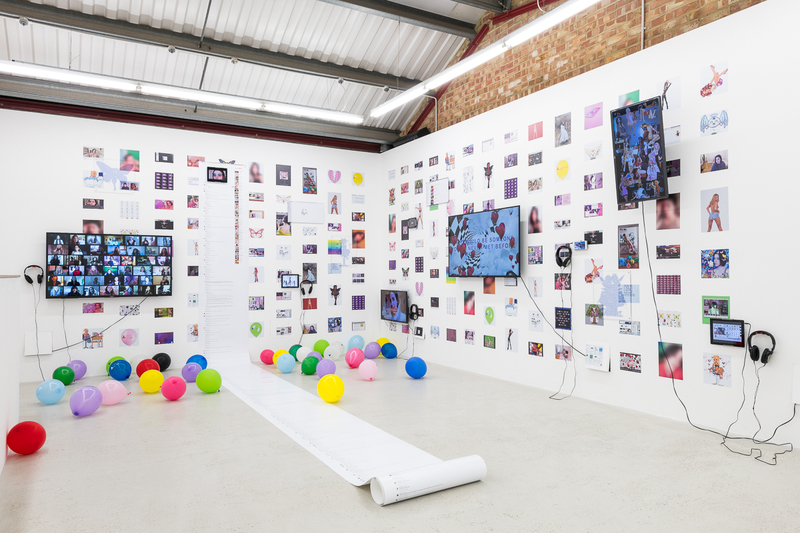 Throw in balloons in the gallery and Youtube snapshots across the walls and it’s as if we’ve stepped into the screen itself. Until 6 June. Two artists look at life in Zimbabwe post-Mugabe – a country in recovery. 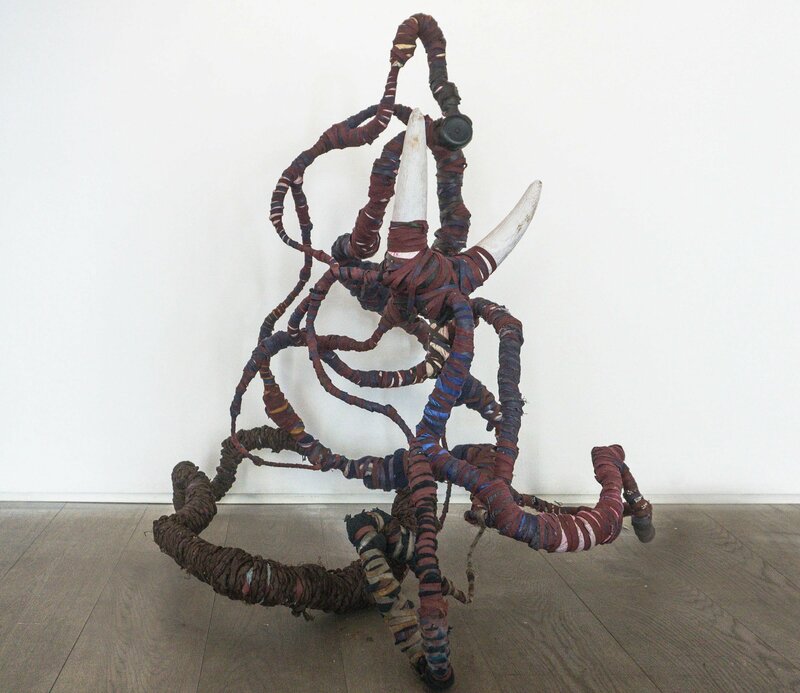 The sculptures of Takunda Regis Billiat stand out integrating objects that give a narrative to each work — cow horns symbolise status while broken telephones the crumbling infrastructure. Until 2 June. 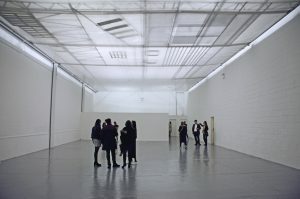 This entry was posted in Art Reviews., EXHIBITIONS, The Top 5 Art Exhibitions to see this week and tagged annka kultys, David Wightman, eskenazi, fitzrovia, Fran Giffard, FVU, Gasworks, gogottes, honor oak park, imran peretta, jerwood space, Kristin Hjellegjerde, kubatana, Mayfair, molly soda, orphan dance, osias yanov, soho, someth1ng gallery, The Photographers Gallery, vauxhall. Bookmark the permalink.